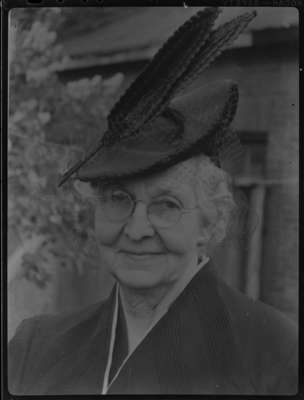 A black and white portrait photograph of Mrs. J.J. O'Connor wearing a hat. Mrs. J.J. O'Connor was the wife of John Joseph O'Connor (1859-1939). Her full name prior to marriage was Ellen Jane Coulson (1869-1947). She was very active in church affairs, bing a past-president of the Catholic Women's League, member of the Women's Institute and a volunteer worker for the Red Cross Society. The O'Connors had five sons (Frank, Wilfred, George, Basil and Jack) and three daughters (Kathleen, Helen and Marie). Mrs. J.J. O'Connor, 1947, Marjorie Ruddy. Whitby Archives A2013_040_1273.